As I mentioned in my last post, I had hit a wall with my cooking. The vegetarian aspect only made it slightly more challenging. I took some time off from fretting about it, then I was ready to move forward. Time to get the cooking mojo back. Like anything you do regularly, it’s easy to get tired of it or frustrated with it. Exercise routines, work, dinner. All things that can quickly run into a rut which makes you want to give in completely. Sometimes you need to take a break or try something new to get your inspiration back. I combed through these cookbooks, checked blog posts I had liked, and gave some thought to what would taste good to come up with some new dinner ideas. Here’s the list of what I’ve got on the cooking docket. Wednesday night I made a (another) tasty rice casserole from the Super Natural Every Day cookbook by Heidi Swanson. It had cottage cheese, wild rice, and chopped mushrooms in it which made it rich and meaty. It was topped with Gruyere cheese which made a crispy, cheesy topping. Everyone liked it, no one knew there were mushrooms in it. Definitely a win. Coming up next is an Asparagus Quiche with Goat Cheese. I try very hard to stick with in-season, locally grown produce. But I spied some tasty asparagus in the grocery store and couldn’t resist. It will still be a few weeks before we see any asparagus here. And we’ve got to eat. This will make a lovely dinner and I can carry the leftovers to work for lunch. Or breakfast. Goat cheese is good for any meal. Deborah Madison doesn’t write a bad recipe, so I’m looking forward to trying some Cabbage Parcels with Sweet and Sour Sauce. However, the filling seems a little labor intensive for weeknight cooking and I’ve got several cups of cooked wild rice leftover from the rice casserole. So my plan is to create my own riff on the filling while using her recipe for sauce and cooking method. After I give this a whirl I’ll share the recipe and let you know how it turned out. Black bean burgers are also on this week’s Must Eat list. I’ll googled around until I found this recipe from Sandra Lee. Based on the comments, the recipe looks pretty solid. I may not make it exactly as written, but I’ll let you know what I do and how it turns out. I like the idea that it comes with instant leftovers for another meal. In my back pocket for when the weather gets warm (IF the weather ever gets warm!) I’ve got some taco recipes that I’d like to try. And I’ll be so glad when some salads come back into the rotation! Salad is great but I crave hot food in the winter. I’m also looking forward to having this for lunch this week. It definitely looks like one of those meals I could eat many days in a row until I make myself absolutely sick on it. Here are the cookbooks I’m using for inspiration. Do you have a favorite cookbook? 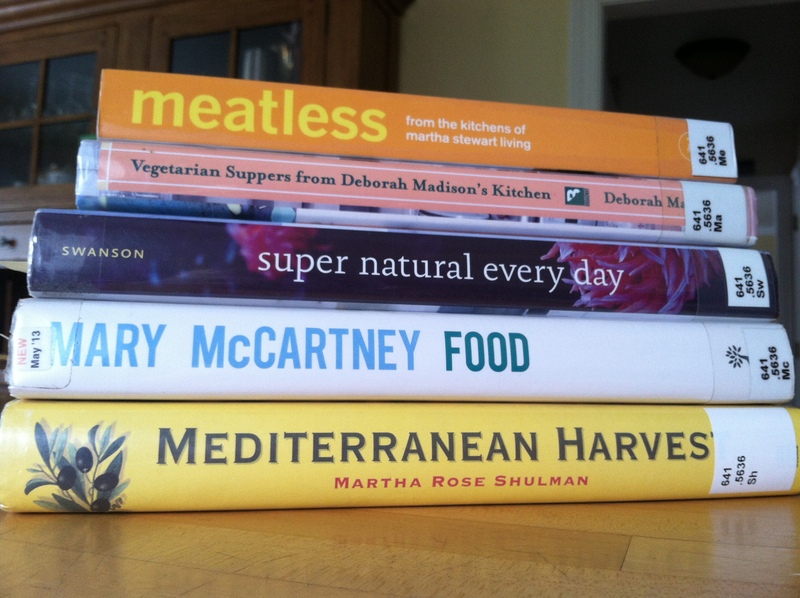 A favorite vegetarian cookbook? How do you get out of a cooking rut? What are you cooking these days? See where I began here. Post your ideas on Twitter using #40dayvegetarian. And checkout my other blog, 3oclockproject!